Buddhist monks visited the Student Center last week to construct a mandala, a geometric sand sculpture. After painstakingly crafting the piece over five days, they swept it up and poured it into the reflection pond in the Vincentian Residence courtyard to demonstrate the impermanence of joy. 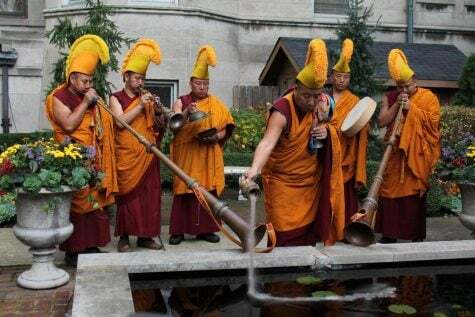 The monks will return to their monastery after their yearlong tour of the U.S. and never leave again for the rest of their lives. While students and professors rushed through the Student Center to grab food and make it to their next class, a group of Tibetan monks calmly occupied part of the first floor to create a sand mandala as part of a meditation last week. 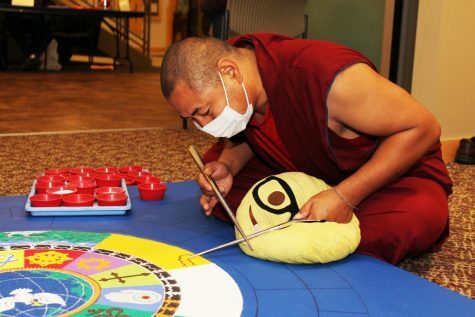 Eight monks worked on the mandala from Monday through Thursday from 10 a.m. to 4 p.m. each day. Students were welcomed to sit nearby and watch the creation of the mandala. This process is viewed by the monks as a form of meditation and offering to the Dalai Lama and the Buddha. The monks who visited were selected among the 2,500 monks who take refugee in the Drepung Gomang Monastery in Southern India. The monks are in the United States for a year-long trip. 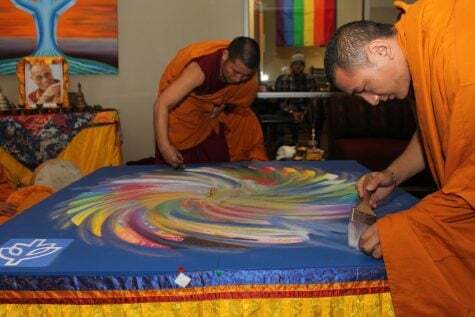 During their time in America, they will visit other universities and create sand mandalas to visualize impermanence. They will also be promoting their monastery and promoting their message with their sand creation and deconstruction. David Wellman, a professor in religious studies, housed the monks in his home while they stayed in Chicago for the week. During the closing ceremony, the monks deconstructed their sand mandala, sweeping the sand from the mandala into little bags for students and other visitors. The majority of the sand was then deposited into the reflection pond outside of the Vincentian Residence building.